Here at TheEstablishingShot.com we love film making competitions, not only do we occasionally participate in competition but we try to get the word out to as many people as possible when an opportunity comes up. We feel competitions are good because with relatively little effort, they allow you to flex your film making muscles, practise new techniques, indulge in an interesting subject matter or as Oscar winning Director Tom Hooper once said to us “have a go. I think to know whether you are good at doing it, you can only find out if, you are doing it” – and the bonus of possible recognition or great prizes. But rarely do we get the opportunity to see behind the scenes of a competition or get insight into the thinking behind entries and the passion of the young challengers involved. A while back as part of their make.believe ethos Sony held a competition for young film makers to remake the trailer for Priest 3D. The competition was open to the public as well as to a film school where students were given the chance to pitch their approach to re-editing the Priest 3D trailer. From their video pitch, 3 students were selected to edit the Priest 3D overnight using assets supplied by Sony and then flown out to LA to pitch their trailer to a Priest 3D panel. With the final winner getting the once in a lifetime opportunity to hang around the Sony Studios, visit different film making departments, drop in on sets, meet people in the business and get an idea the bigger picture of film making. An awesome prize for any aspiring film maker. Priest 3D is a Sony Pictures’ production embodying Sony’s make.believe (pronounced make-dot-believe) based on a popular Korean genre bending futuristic, western, martial arts, supernatural graphic novel series Priest by Hyung Min-woo. And follows a warrior priest who returns from hiding to rescue his abducted niece from a group of ancient vampires who are intent on turning her into one of them! 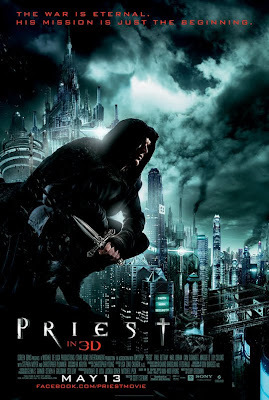 The team behind Priest 3D includes; Scott Charles Stewart (Legion and VFX on a slew of features including - Iron Man, Blade Runner, Grindhouse, Pirates of the Caribbean, Superman Returns, Harry Potter and the Goblet of Fire, Sin City, Jurassic Park, etc.) and Producer Sam Raimi (Spider-Man, Evil Dead, Drag Me to Hell). Here is a short video of how the competition went and the 3 entries as well as some thoughts. The three re – edited Priest 3D trailer entries. Saba’s intention was to use the existing narrative but spice it up, make it faster, punchier and more exciting. In essence I think Saba’s entry would have worked better if it was the 3rd or 4th teaser trailer in an ongoing campaign of trailers - where the context of the Priest film had already been established. As an introduction it feels a little short - which is interesting as it has the longest run time of the 3 trailers. Although the visuals stuns, it feels jerky like the narrative flow is being interrupted and doesn't allow the viewer to engage with the story. Moritz’s pitch was possibly the most ambitious and hinged on reversing the good & evil of the characters or at least creating some ambiguity about their moral positions. I think Moritz started to climb a slippery slope by attempting to reverse the characters moral positions. As a concept it sounds great but I think the existing imagery was probably already very polarising. As a trailer Moritz’s entry works quite well but doesn’t really convey the proposed ambiguity of the characters. Josh’s approach, after identifying what he thought was a pivotal scene - and then to use that scene as the centre of his trailer. In essence creating a 3 act piece. It’s easy to see why the Priest 3D Panel chose Josh’s trailer. It flows well, is very compelling and draws you in with it’s narrative. The use of dialogue at the right points in the timeline, supports the strong visuals and engages with the viewer, leaving them interested and wanting more. Part of this post was Sony’s interest on variations or alternative approached to re-editing the Priest 3D trailer. It’s hard to say what I would have tried to do given the opportunity without knowing the exact materials or assets Sony offered to the participants. But after watching the Priest 3D trailer and the re-edited versions I like the idea of clear good & evil and echoing that in a trailer by using light and darkness. My approach would be to have a music and dialogue free trailer that would consist of a montage of scenes, shortening in length each punctuated with a light flash and loud rumbling noise - building up to a climax. That would wind down with the candle been blown out (bringing the light flashes full circle), fade to black and suddenly we flash back into life with a roar as we see the over head shot of Priest on his motorcycle heading into the desert to the voice over of “Forgive me father”. Sony have also created a neat Priest 3D Facebook application that allows you to morph one of your profile pics into one of the characters types from Priest 3D. As Priest 3D features two types of characters the 'priests' and the vampires, both with distinct physical appearances. Sony designed a Facebook application that allows you to choose a photo of yourself or others and apply the facial appearances of the films characters. Stars: Paul Bettany, Lily Collins, Cam Gigandet, Maggie Q, Karl Urban, Brad Dourif and Christopher Plummer.